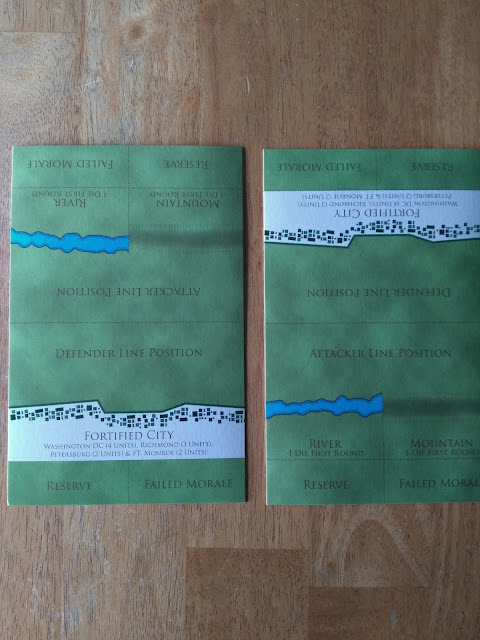 Worthington Publishing has graciously sent me a few of their games to review. 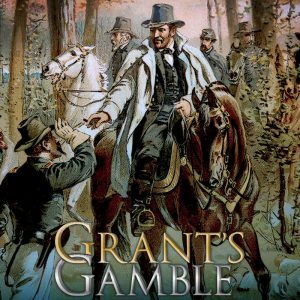 I will start with the game Grant's Gamble. I picked this game because I have read everything I could find on the campaign, and have walked a lot of its battlefields. After opening the box, I am pleasantly surprised. 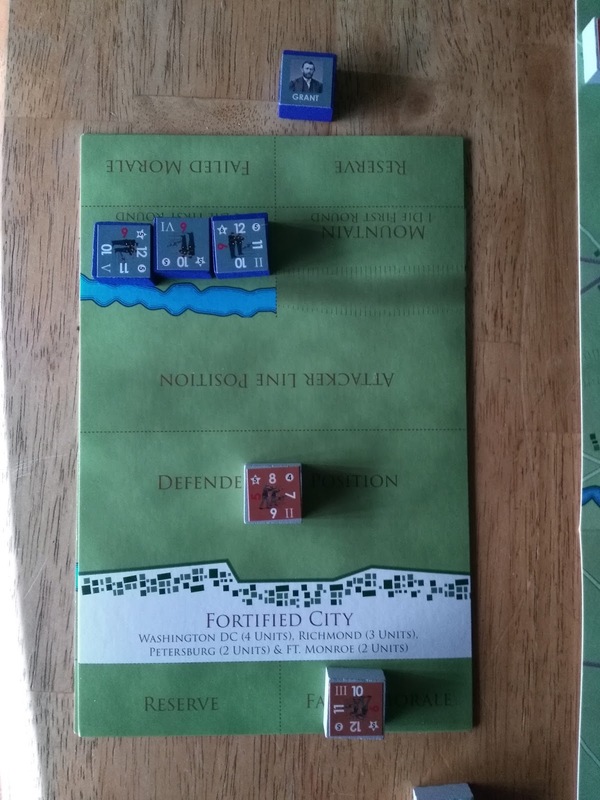 The game also comes with the units and an extra map piece to allow you to play McClellan's 1862 campaign. 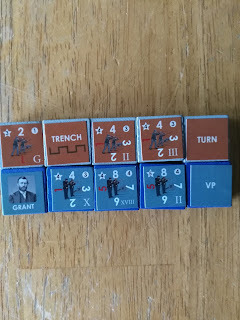 The game uses small plastic blocks for the units. I have seen reviews about block games, but have never played one. The blocks need to have the stickers that represent the units attached to one of their sides. When seeing pictures of any block games before I couldn't help but think of 'Stratego'. I see now how this is just a simple and elegant way to simulate the 'fog of war'. The map is hardbound. It is not ablaze with colors or features, but at the scale we are playing it works just fine. The map is mostly of the state of Virginia with a bit of Maryland at the top. The game uses point to point movement to simulate the campaign. All of the components strike me as utilitarian instead of games where the developer tries to make it a piece of artwork. There is nothing wrong with the artwork approach, but I have been playing games long enough to know it is the mechanics and rules that make a game and not the visuals. If the game is beautiful but sits on the shelf what good is it? After attaching all the stickers to the blocks, one thing becomes very clear. The Army of Northern Virginia and the other Confederate units are awash in a sea of blue units. I have played a good number of games about the 1864 Overland Campaign, but I do not remember the paucity of Confederate units being so visually brought home. It is probably because of the scale, which is for the most part Corps. The goal of the game is just as it was in history. For the Union, take Richmond or cut the railways to it. Richmond is worth ten victory points and Petersburg is worth five for both sides. 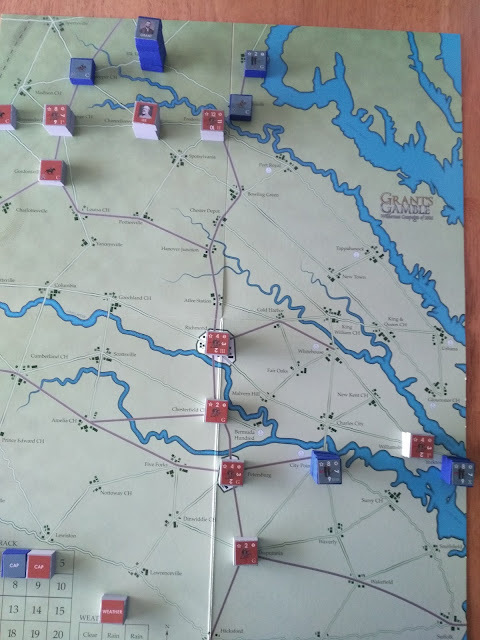 The union player gets two victory points per turn if he can cut the railroad to both cities. For the Confederates, you must delay or as Lee said, 'strike them a blow'. Per Lee, if the campaign is turned into a siege of Richmond it is just a matter of time before the manpower and material of the Union wins. The rule book for the series is just eight pages long. The separate game rules for this game are just two pages. Worthington wanted the games in the series to be played, and not have the players debating the rules. The weather roll sees if it is clear or rainy for this turn. If it is rainy all movement is reduced by one, unless it is the second rainy turn in a row, then movement is reduced by two. Supply in the game is rather abstract. When a unit is activated, it must trace a line to one of two points on the map without going through an enemy infantry or garrison unit for it to be in supply. Units that are out of supply lose one movement point, and may not receive replacement points. I think that cavalry should be able to block supply also. In actual fact raiding did not have a great impact in the eastern theater of war, but it did with the greater area of the western campaigns. When I am comfortable enough with the game system, I will look into supply a bit more. Both the Confederate and union player receive one replacement point per turn. CAP (Command Action points)) are both at a three for each side normally. Both Grant and Lee are listed as having a command rating of seven. Using two die, if you roll a seven or above during the CAP roll you will receive one extra CAP point for your side. it takes one CAP to move a unit one point. Battles happen if both sides occupy a location. Battles take place on a battle board. Fortifications, mountains, and river crossings affect the odds in battle. There is a 'cavalry screening action' rule to simulate each sides cavalry ability to stop or slow enemy movement. There is an automatic victory rule for both sides. For the Union, it is if they occupy Richmond and Petersburg, or if the Confederate infantry strength points fall below fourteen. For the Confederates, it is if the Union infantry points fall below twenty-eight. Both leaders have a special ability in the game. Lee's is a reaction movement; any units stacked with the Lee piece can move to one adjacent location. 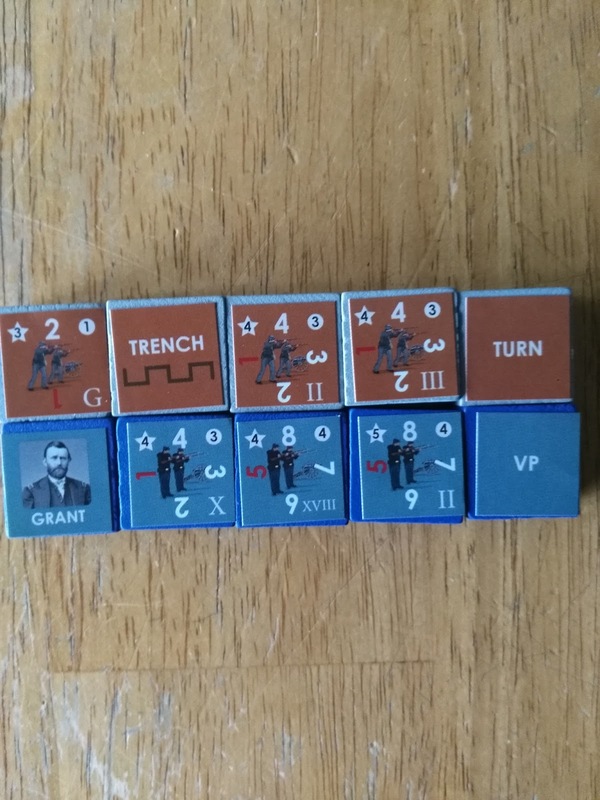 Grant's ability is for the Union player to re-roll any one failed morale check during each round of battle. The Union player can also move one unit per turn, for two CAP points, from one friendly port to another. 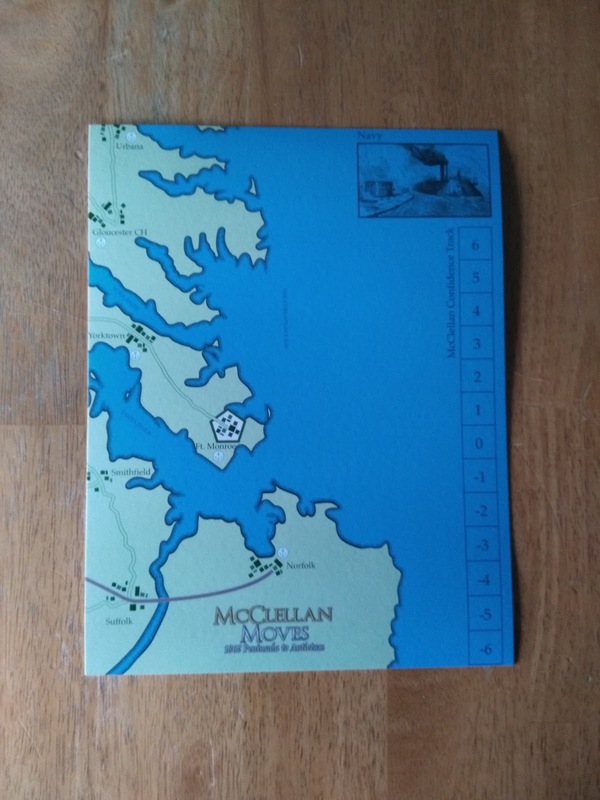 Thus, you can try McClellan's 1862 approach in the 1864 campaign. For the Confederates, there is a rail movement of two units per turn, at a price of two CAP points per unit. There is no rail movement allowed for the Union. The first battle has Grant and three corps (II,V,VI) attacking Lee in Chancellorsville with the Confederate III corps and a trench marker. The defender rolls six die, the number of rolls for attack are in the upper right hand corner of the unit. 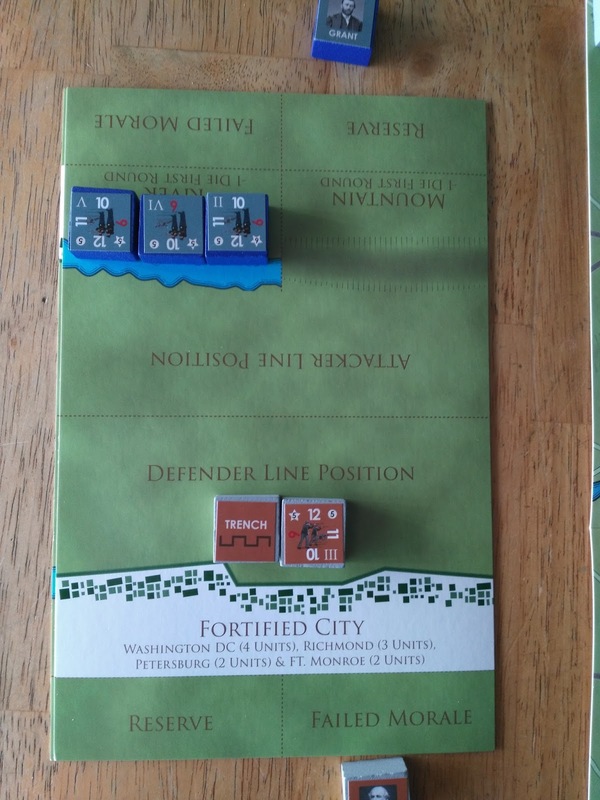 In this case a five, and one more die roll for the trench marker. Hits are achieved on a roll of six on each separate die. The three Union corps roll four die each (five normally, but one is subtracted for attacking across a river). The Confederates roll one six for a hit on the Union II corps, while the Union rolls two sixes for two hits on the Confederate III corps. After all hits are applied, the units involved must pass a morale check. You pass/fail the morale check by rolling one die per unit. If you roll a higher number than the number in the star in the upper left of the unit, you fail the check. The attacker checks his units first. In this case both sides' units all pass the checks. You can either voluntarily retreat from battle or be forced to. In this case, neither side wants to back down so we begin battle round two. The players then are able to roll two die to see if any reinforcements are available. The reinforcements can come from one movement point away. Two die are rolled and if they equal or are greater than the commander's rating, the unit can reinforce the battle. The Union player has no units near, and unfortunately for the Confederates both fail their reinforcement check rolls. The next battle has the Confederates rolling for two hits and the Union player for none. 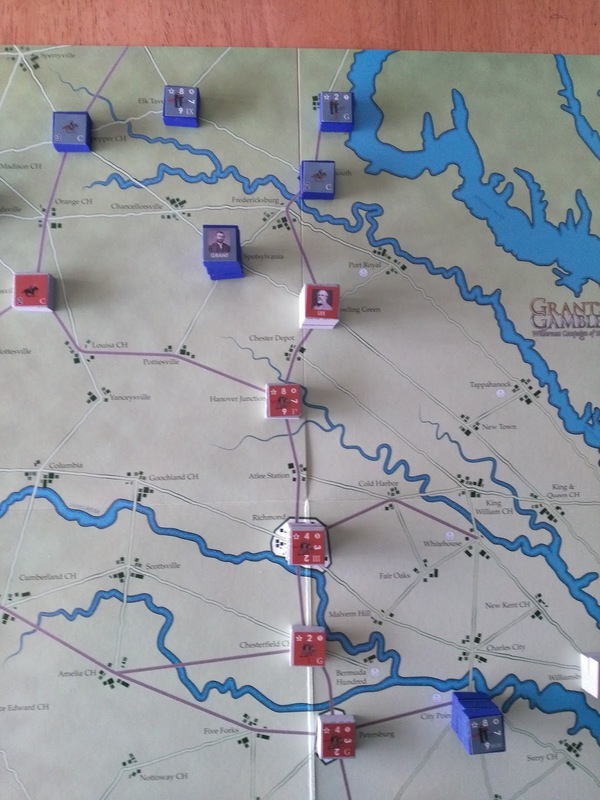 After this round neither side retreats, and the Confederate II corps passes its reinforcement roll. The next battle round the Confederates make one hit roll and the Union three. On the subsequent morale check the Confederate II corps fails. The Confederate player elects to retreat from battle. The side staying on the battlefield gets to roll one die for each of its units to see if they get a hit on the retreating forces. As it is during the battle rounds, you have to roll a six to get a hit. The retreating side can move one point away from the battle. If it were a forced retreat, the retreating force has to move two movement points. 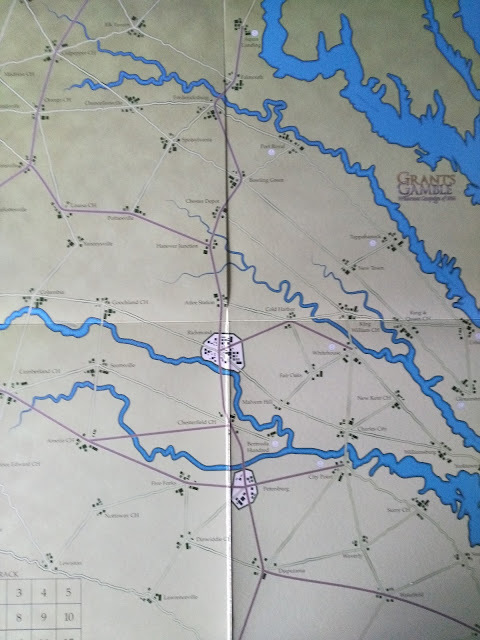 This is the situation after the Confederate move on turn one. The Confederate 1st corps has beat a retreat to be near Lee and the other two corps. If Grant attacks the isolated 1st corps, Lee's reaction move can bring the other two corps with him to the rescue. The only problem being is that because of the long movement of the 1st corps, and the retreat from battle of the other two, none of the Confederate corps are now in trenches. To me, the game rules make it feel like you are in Grant's or Lee's shoes. You want to do so much each turn, but are really hobbled by the amount of troops you can move, and actions you can take each turn. As the Union, you really want to get your corps fighting Lee's right away. On the other hand, you also want your other forces to start to put the squeeze on Richmond. As Lee you have to really pray your opponent makes a mistake that you can capitalize on. This game is a player's game. 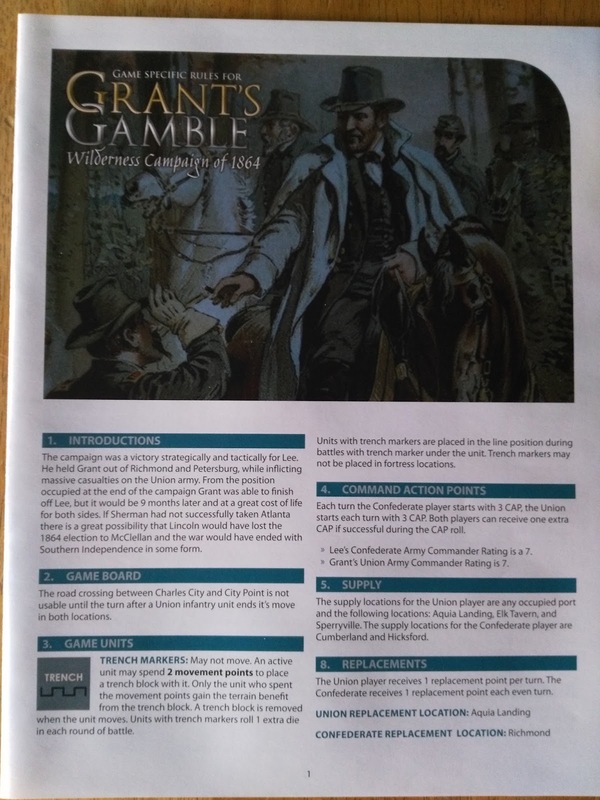 It is one that will sit on your table for a while with you playing game after game to try different strategies, and that is only the 1864 Campaign. 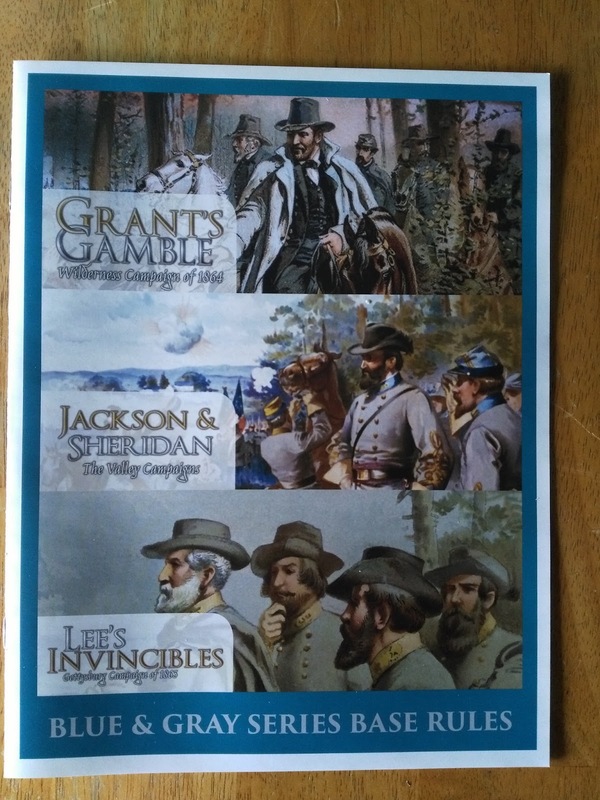 After you are done with that campaign, you still have the 1862 one to try out. Great review and well illustrated, thanks. The replayability of this title prompts me to put it on the purchase list.